Actors dressed in period clothing guide audience members through dark tunnels first to a themed refreshment area, all classic wood paneling and battered leather suitcases to emanate the time the story is set, and then to the correct 'platform' for departure. Upon entering the auditorium you instantly feel like you're inside a real railway station as tracks run down the middle of the stage, with staggered seating on both sides. The story centres on three children, Bobby, Peter and Phyllis, who are forced to leave their privileged London life behind with their mother after their father is arrested on suspicion of espionage. For an adult used to the spoils and entertainment of a big city, the English countryside would soon become a bore but for these three children it means endless adventures; from waving to the trains that come through the station, to making friends with the locals and people passing through. From an audience perspective the sentiment will be very similar, what may seem rather insipid to the adults in the audience, was visibly magical to the younger children watching the story unfold in the auditorium. They were perched on the edges of their seats as they followed the adventures of the three siblings, from their ingenious plan to stop a train heading for disaster, to their kind-hearted attempt at helping one of the villagers. The highlight of the production, for young and old, was no doubt the impressive staging. All throughout, the 'tracks' running through the middle of the stage were utilised to emanate movement and change to the setting, and when in a hazy cloud of smoke a real-life steam train drove into the theatre as the impressive interval show-stopper, it received gasps of awe and a well-deserved round of applause. 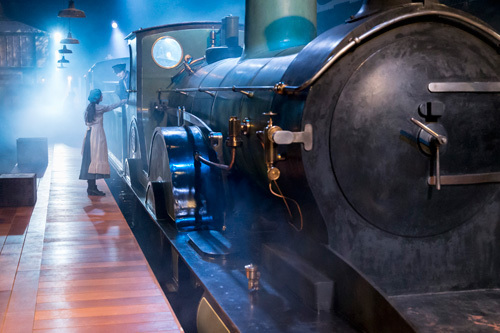 The story is perhaps not quite as gripping for adults as it is for younger children, but the atmospheric, immersive approach to theatre and the show-stealing train at the heart of the production, make this a great family outing. The Railway Children is running at the King's Cross Theatre and is currently taking bookings until 6 September 2015. Buy tickets here.